Ever since I purchased my first cabochons from Gary Wilson at my very first Bead Fest Philadelphia back in 2003, I've been obsessed with figuring out how to bead around them so that I can use them in other beaded jewelry projects. And while I love the techniques of bead embroidery for bezeling around a cabochon, as the working mother of a five-year-old, I sometimes find that knowing how to bead a quick bezel in less than twenty minutes can put me on the fast track to a new piece of finished jewelry! Working on my most recent challenge project for Beadwork magazine, I wanted to figure out how to bead a lacy, open bezel for a set of sea glass components. I've seen other tutorials for netted bezels that begin on the back of the cabochon, but I never liked the finished look, so I decided to start at the front and work my way back. 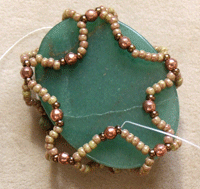 What I discovered was that this technique works for just about any shape or size of cabochon, stone, or component, it takes less than five feet of beading thread, and it takes less than thirty minutes to complete. Give it a try! Step 1: To begin your netted bezel, cut a five foot length of thread. String a stop bead, leaving a 6" tail. 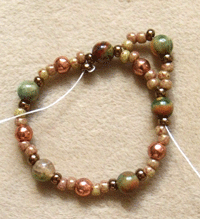 Pick up 1 B, 1 D, 1 B, 2 A, 1 C, 2 A. Repeat until you have a total of 5 C. Pass through the first 3 beads strung and pull snug. Step 2: Pick up 3 A, 1 B, 1 D, 1 B, 3 A and pass through the next B-D-B in the ring. Step 3: Repeat around for a total of five "points" on your star. 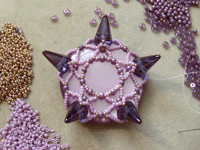 Pass through the first 5 beads added in the previous step. Step 4: Pick up 7 A, 1 B, 1 C, 1 B, 7 A. Pass through the next B-D-B set of beads from the previous round. Repeat around, passing through the first set of beads added until you exit from a B-C-B set. Place your cabochon face down in the center of the bezel. The "arms" of the netting should extend around the cabochon and reach onto the back. Step 5: Use your fingers to gently pull the last round of netted "arms" around the back of the cabochon, while keeping the tension on your working thread taught. Pick up 5 A, 1 B, 1 C, 1 B, 5 A, and pass through the next B-C-B set of beads in the previous round. Repeat for a total of 5 C.
Step 6: Pick up 1 C, pass through the next B-C-B set of beads in the previous round. Repeat until you have added a total of 5 C.
Weave your thread through the circle several times, tying a few half-hitch knots as necessary and adding a drop of glue if desired. Weave your thread into the bezel and trim close to the beadwork. Step 7: Flip the bezel over and remove the stop bead. 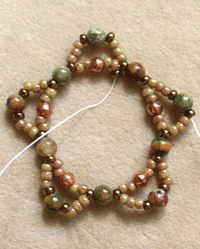 Weave the tail into the initial ring of beads, tying a few half hitch knots and adding a drop of glue if desired. 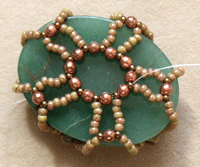 Weave any remaining thread into the bezel, and trim close to the beadwork. 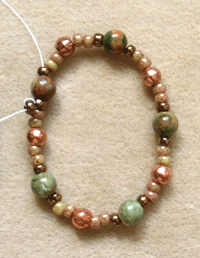 Now, here's the fun part: you can customize this for any cabochon or stone using any beads you have handy! 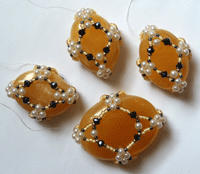 For square cabochons, make an initial ring of beads using 4 gemstone or 4mm beads. 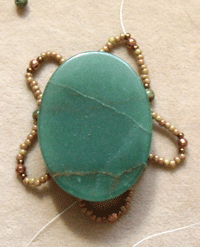 Wrap your netted "arms" around the corners of the cabochon, and cinch together on the back of the cabochon. 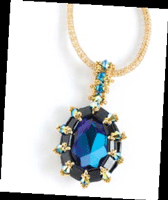 Think about embellishments for your finished netted bezel. You can add thinks like spike beads, gumdrop beads, or even vintage nailheads. If you want to add your embellishment beads spaced out evenly, make sure you have an odd number of gemstone or 4mm beads in your initial ring. 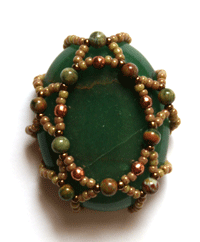 For round cabochons, you can use an even number of gemstone or 4mm beads in your initial ring. You can make your netted bezel with more rounds, as pictured with my spiky cabochon netted bezel. Add lots of other embellishments when you've finished with the bezel like extra rounds and layers of beads, or leave it as it is, add a quick beaded bail, and string it on a beaded rope! Thinking about all the awesome ways you can change this up yet? I've got loads of cabochons in my stash, and even better, I've got a huge collection (okay, it's a hoard) of shaped beads including peanuts, two-holed seed beads, spikes, Tilas, and more! If you've got a hoard of shaped beads like I do and need a little inspiration for using them, check out the Shaped Beads Ultimate Collection, available exclusively in the Beading Daily Shop. My favorite thing about this collection? It's all in digital format, so you get access to the video, eBooks, and three beading projects instantly! If you need some new ideas for how to bead with your Tilas, peanut beads, bugle beads, and two-holed seed beads, check out the fabulous Shaped Beads Ultimate Collection and use up those beautiful shaped beads in your stash! What's your favorite way to bezel a cabochon or undrilled component? Do you use peyote stitch? Netting? Right-angle weave? Share your favorite beading techniques for bezeling, and leave a comment here on the Beading Daily blog! This is the nice tip. Thanks! Thanks for the tip. I am going to try this out.